Col. Thomas Sherman and his wife. Whitney Vickers | Greene County News Lt. Gen. Robert McMurry, commander of the Air Force Life Cycle Management Center; Col. Thomas Sherman, incoming 88th Air Base Wing commander and Col. Bradley McDonald, outgoing 88th Air Base Wing commander during the change of command ceremony. Col. Bradley McDonald giving his final salute. 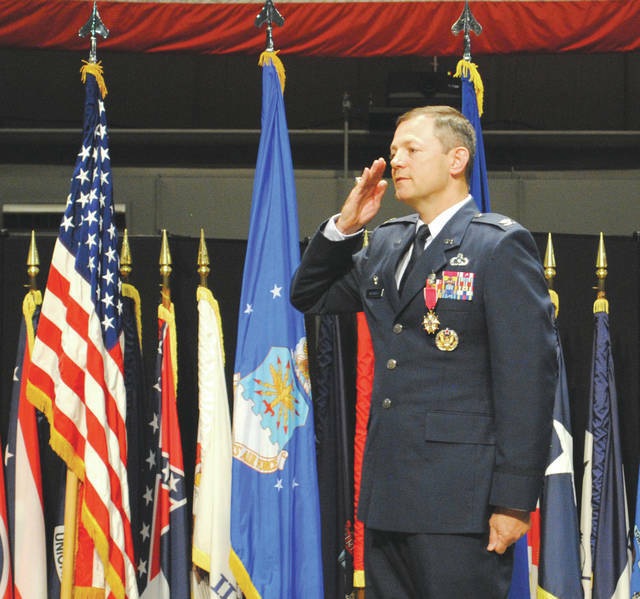 WRIGHT-PATTERSON AIR FORCE BASE — Col. Bradley McDonald relinquished command over the 88th Air Base Wing of Wright-Patterson Air Force Base June 19 to Col. Thomas Sherman. The wing, with more than 5,500 military, civilian and contracted employees, is one of the largest in the Air Force. McDonald graduated from the Air Force Academy in 1994 and has held a number of leadership and staff positions. 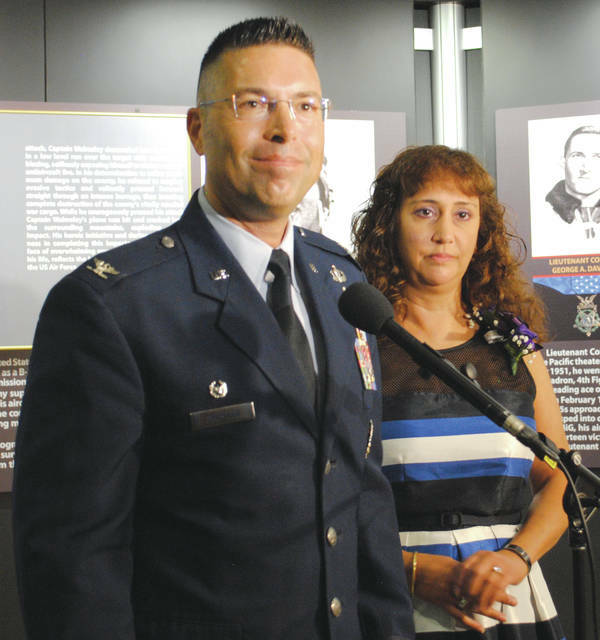 Prior to serving WPAFB, he was the vice commander of the 10th Air Base Wing of the United States Air Force Academy in Colorado Springs, Colorado. McDonald will retire from a 24-year career in the Air Force following his service to WPAFB. 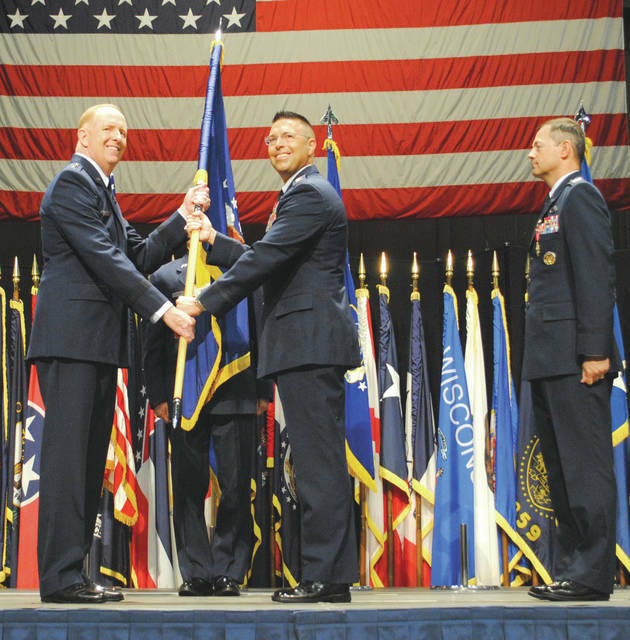 He began his time as commander of the 88th Air Base Wing on June 21, 2016. Sherman previously served as the commander of the detachment 1 of the Air Force Installation and Mission Support Center at Peterson Air Force Base in Colorado. He graduated from the Air Force Academy in 1995 and has since been a six-time commander in a number of positions. https://www.beavercreeknewscurrent.com/wp-content/uploads/sites/49/2018/06/web1_88abw1.jpgCol. Thomas Sherman and his wife. https://www.beavercreeknewscurrent.com/wp-content/uploads/sites/49/2018/06/web1_88abw2.jpgWhitney Vickers | Greene County News Lt. Gen. Robert McMurry, commander of the Air Force Life Cycle Management Center; Col. Thomas Sherman, incoming 88th Air Base Wing commander and Col. Bradley McDonald, outgoing 88th Air Base Wing commander during the change of command ceremony. https://www.beavercreeknewscurrent.com/wp-content/uploads/sites/49/2018/06/web1_88abw3.jpgCol. Bradley McDonald giving his final salute.